Douglas Wright is a well-known author and illustrator from Argentina. He writes clear, fun Spanish poems for children. Activities for the poems are easy to create, making the poetry wonderful for language learners. I use Douglas Wright’s poetry with Spanish learners because the language is accessible, the poems are from a child’s point of view and children identify with feelings and experiences. They also have rhythm and rhyme so they are fun to recite. With this Spanish poem for children, activities using rhyme are an excellent way to practice pronunciation and the sounds of the language. Mi casa está viva has familiar vocabulary, simple grammar and lots of repetition. In addition, Douglas has illustrated the poem and put it to music. Click here for the poem with illustrations. Click here for the song. Douglas has very generously given me permission to share his poem on Spanish Playground. A translation (not literary – strictly for meaning) and suggested activities follow the poem. mi casa es mi amiga. Translation – This translation is provided for meaning. It does not conserve the rhyme or rhythm of the poem. mi casa me mira. / my house watches me. olor a jabón, / the smell of soap. y olor a salón. / and the smell of the living room. y olor a verdín. / and the smell of mildew. mi casa me cuida. / my house cares for me. cantan su canción. / sing their song. y de la escalera. / and the stairs. mi casa me mima. / my house spoils me. luz en el malvón. / light on the geranium. luz en los reflejos. / Light on the reflections. mi casa es mi amiga. / my house is my friend. sin ningún apuro. / without any hurry. hasta la mañana / until morning. 1. Read the poem and listen to the song version. Make a simple activity by removing rhyming words from the poem. This printable PDF uses the whole poem, but you could also choose a few stanzas and do them as a class. 1. Students draw their own homes as living things, like the houses in the illustrations. First, talk about what the house in the poem does. El hablante dice que la casa del poema está viva. ¿Por qué dice eso? ¿Qué hace la casa que hace un animal o una persona? (rie, canta, mira, cuida, mima). Then talk about what their houses or apartments do (escucha? habla? juega? esconde? protege?) Then kids draw their house with the body parts it needs and add a sentence of explanation: Mi casa escucha a mi familia. Mi casa me protege. 2. Talk about what senses the speaker of the poem uses to experience his house and identify specific examples (Olfato – olor a comida. Oído – suenan las tablas de la escalera. Vista – luz en las ventanas. ). Have students make a drawing of a face. They write the examples around the face and connect them to the correct body part with a line. They could also do this with the way they experience their own homes as a pre-writing activity for #3. 3. Students list sounds, smells and light in their own homes. 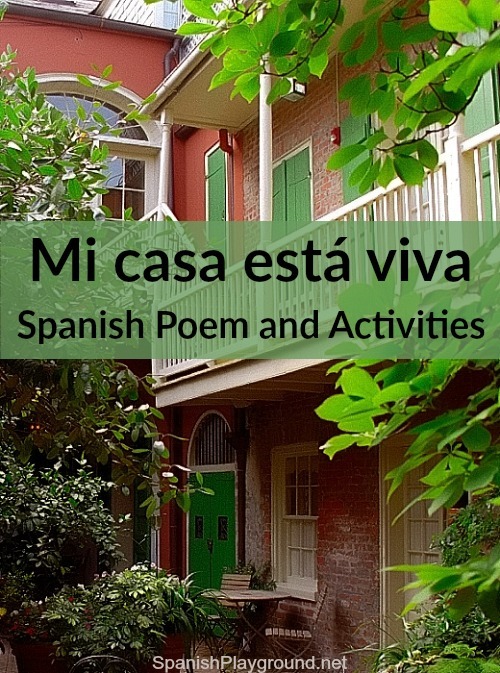 They can use these lists to write a short poem based on the structure of Mi casa está viva. 4. Talk about the line Mi casa es mi amiga and the idea of a place as a friend. How is the house a friend? Ask students to list the characteristics of a friend. Ask the children to identify other places that they consider “friends” (park, grandparent’s house, car, yard, soccer field, library). Do these other places perform the same functions as the house (cantar, mirar, cuidar, etc.)? Do they do other things? Have students draw another place “alive” based on the illustrations of the poem. 5. Discuss vocabulary in the poem. For example, pieza is a common word for bedroom in Argentina. What other words have they learned or heard for bedroom (cuarto, habitación, recámara, dormitorio, alcoba)? Talk about other variations in vocabulary from one country to another, particularly words for food and clothes.